The health of your child’s teeth and gums is an important part of their overall health and well being. Though your child will lose their first set of teeth, it’s important to start early to set the foundation for healthy teeth later in life. You can start by choosing an experienced and caring family dentist. Make an appointment with Dr. Donnelly and his team at San Marcos Gentle Dental. Dr. Donnelly proudly serves patients of all ages throughout San Marcos, TX, Kyle, Wimberley, New Braunfels and surrounding communities. Your child should start to see a dentist no later than his or her first birthday. Caring for their “baby teeth” should be a top priority because those teeth help children speak clearly and chew naturally. They also aid in forming the path that the permanent teeth follow when they are ready to erupt. After the first appointment, a check-up every six months is strongly recommended to prevent cavities and other dental problems. When your baby’s teeth first appear, you can start brushing them twice daily using a fluoridated toothpaste and a soft, age-appropriate toothbrush. You should use a smear of toothpaste to brush the teeth of a child less than 2 years of age, and a pea-sized amount of toothpaste for a 2-5 year old with assistance brushing. 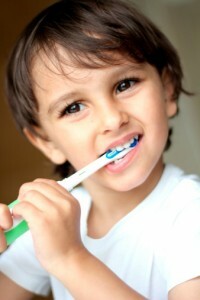 Remember that your child does not have the ability to brush their teeth independently at this age. Dentists now have advanced diagnostic tools like DIAGNOdent to help them to catch decay earlier than ever before. As your child grows you should limit their daily servings of sugars and starches to protect their teeth from decay. The dentist can place dental sealants on your child’s teeth. Dental sealants work by filling in the crevasses of the chewing surfaces of the teeth. This shuts out cavity causing food particles that could get caught in the teeth, . The application is fast, comfortable, and can effectively protect their teeth for many years. If your child participates in sports activities, the dentist can also fit a custom mouthguard to protect your child’s teeth, lips, cheeks and gums from sports-related injuries. A custom-fitted mouthguard developed by a dentist can also protect your child from injuries to the head, like concussions. If your child has developed a prolonged thumb sucking habit (past the age of three) a mouth appliance may also be recommended by your dentist to prevent the formation of a misaligned bite in adolescence. No matter how attentive you are to your child’s dental health, injuries and accidents can happen. Make sure you’re prepared by having a family dentist like Dr. Donnelly on hand to fix any dental emergencies your child may encounter. The health of your family’s teeth is a top priority for you, and should also be a top priority for your dentist. Your whole family will appreciate Dr. Donnelly’s gentle and caring approach to dentistry. Make an appointment today for his San Marcos, TX dental office today. Dr. Donnelly proudly serves patients throughout Kyle, Wimberley, New Braunfels and surrounding areas.